You’ve probably been anxious at one time or another. Most of us have. But more people experience intense anxiety than you might have thought. About 18 percent of American adults have an anxiety disorder in a given year. 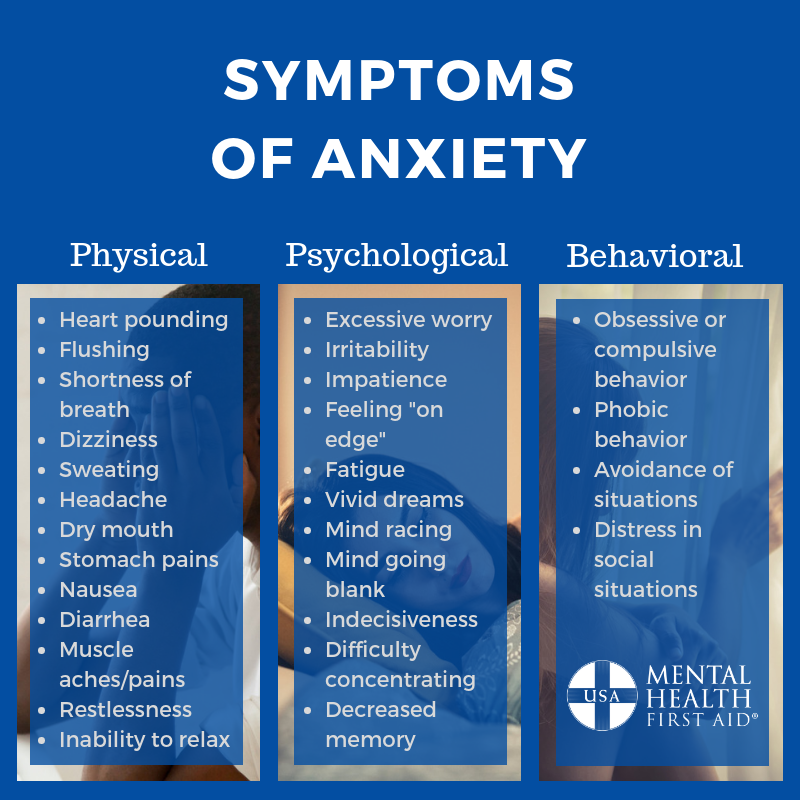 That means almost one in five people around you experiences anxiety for longer periods of time, at higher levels than most people and in ways that impact their daily lives. If you don’t know how to help someone with anxiety, this article will help you figure out how you can reach out and get the person the support they need. 1. ASSESS for risk of suicide or harm: To start, you’ll want to identify if they’re in a crisis. If they’re experiencing an extreme level of anxiety, a panic attack, nonsuicidal self-injury or suicidal thoughts, address that particular crisis first. 2. LISTEN nonjudgmentally: If the person isn’t in a crisis, ask how they’re feeling and how long they’ve been feeling that way. If they wonder why you’re inquiring, explain that you’re concerned and what signs you’ve noticed, but be sure to be nonjudgmental. Be patient and engaged while they speak. Ask clarifying questions and use minimal prompts – like “I see” – to keep them talking. Pay attention and show that you care. 3. GIVE reassurance and information: Your support can have a huge impact on the person. Sometimes it will be difficult – the person might want to give up trying to find help or might get frustrated during the process – but if you’re kind, genuine and persistent, you can help sway them. However, always make sure they’re involved in the decision-making, because treating the person with respect and giving them autonomy is equally important. Maintain positive language – don’t blame them for their illness or symptoms. Remind them that recovery is possible and that you’ll be there for them along the way. 4. ENCOURAGE appropriate professional help: If it appears professional assistance might be needed, offer to help the person understand their options for professional help. Primary care physicians, mental health professionals, psychiatrists and certified peer specialists are all possibilities for getting support with anxiety disorders. Encourage the person to explore these options, offer to help them research to choose the best option and keep them motivated throughout the process. To learn more strategies for supporting people, take Mental Health First Aid. The course will teach you how to identify, understand and respond to signs of mental health or substance use issues. Become part of a movement to change the culture around mental health.